Earlier this year, a Chinese mom gave birth to a healthy baby boy... with 31 fingers and toes. We take a little peek into the condition. Earlier this year, a mother gave birth to a baby boy who was born with 31 fingers and toes. Huffington Post and China Plus News reported that the family of the baby, named Hong Hong, is poverty stricken and lives in China's Hunan Province. The family is seeking assistance to have the baby’s anomaly corrected, but doctors have told the family that Hong Hong, who is about 6 months old, is too young for the reconstructive surgery and the ideal time frame would be between 6 to 12 months. The baby has 15 fingers and 16 toes. He has two palms on each hand with seven fingers on his right hand and eight fingers on his left, but no thumbs. He has eight toes on each foot. Hong Hong’s mother suffers from the anomaly, but has not had it corrected. She, however, only has an extra digit on her hands and feet. The clinical term for having too many fingers, too many toes, or both, is polydactyly. The anomaly is not rare. The American Journal of Orthopaedics (AJO) reported on a study done between 1998 and 2009, where there was a 2 in 1000 live birth polydactyly incidence. The study also stated in the Chinese population it was 3 times more common than syndactyly (webbed fingers or toes). AJO also stated the anomaly was found to be the fourth most common congenital anomaly after clubfoot, cleft lip or palate and spina bifida according to Pennsylvania's Department of Health. It’s been said the anomaly is considered one of the most common inherited hand abnormalities. Polydactyly can be detected by ultrasound from 14 weeks during pregnancy. Health professionals aim to correct the anomaly as soon as possible after birth in order for the patient to have normal hand function and to restore the hand’s appearance. AJO stated the thumb is responsible for 40% of hand function and should be able to oppose the other fingers with a stable pinch. 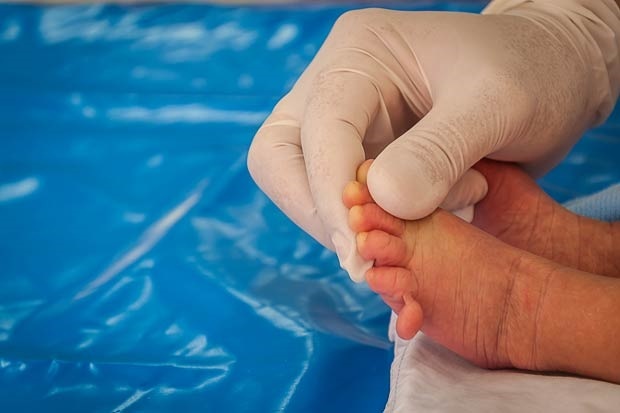 Some extra digits appear to be little stumps or a firm piece of tissue; doctors refer to them as “nubbins”, which means it is underdeveloped or stunted in growth. Sometimes general practitioners don’t refer patients needing simple treatment to orthopaedic surgeons. Other occasions, patients require surgery, because the extra digits have developed into full limbs with bone, tissue and nerves. Polydactyly is mainly divided in two classes - pre-axial and post-axial. Pre-axial polydactyly is the formation of extra digits adjacent to the thumb. Post-axial polydactyly is the formation of extra digits adjacent to the pinkie finger. Mixed polydactyly combines the two - it’s the presence of pre-axial and post-axial polydactyly. Central duplication - extra digits formed alongside your pointer, middle or ring finger - is not as common as pre-axial and post-axial polydactyly. Often the presence of central duplication is inherited from one or both parents’ genes. The condition could also be associated with a number of other illnesses or syndromes such as Down Syndrome, Bardet-Biedl Syndrome and Holt-Oram Syndrome. Quite a number of celebrities have the condition as well. It has been reported that Oprah Winfrey, Halle Berry, Maria Sharapova and Kate Hudson have had an extra toes removed. Bond Girl, Gemma Arterton, Hollywood actor, Taye Diggs, and Bollywood star Hrithik Roshan were born with an extra finger on each hand. Do you know of anyone who was born with extra digits on their hands, feet or both? Let us know what your experience and thoughts are about the condition by emailing chatback@parent24.com.